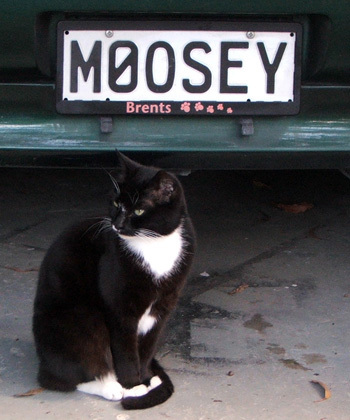 On-line voting for your favourite vegetable, movie, or president is a trivial pursuit when compared to the Moosey Most Valuable Pet competition. So who have you been voting for? And have you been happy with the selection of pets on offer? Up until March, 2010, your choice was between two dogs, two rather vague, nameless group entries (sheep and poultry), and a selection of cats, the majority of whom were dearly departed. Of course, being dearly-departed cannot make a pet ineligible. 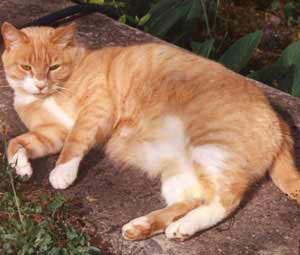 The Moosey Most Valuable Pet competition has always had very successful posthumous pet contestants - in fact, the current winner by a country mile, Gingerpuss, is the most posthumous of all. But I must confess. I lost interest in the Most Valuable Pet competition when I couldn't vote for one of my five new, vibrant, youthful Moosey cats. Three socialised wild kittens Percy, Histeria and Lilli-Puss took up huge chunks of my time in 2008. Then, just when I thought I'd never have another kitten to look after, I found young Minimus in the woodshed. In 2009 lovely Kaya, sleek and black, came to live here. It's sad but true - the youngest are often the cutest, and they weren't on the list of contestants! Then came a momentous day. On March 14th 2010 the webmaster did some Moosey website work, and suddenly all the newbies were there on the graphs page. The MVP now had twenty-one contestants, and the live cats outnumbered the dearly departed! Yippee! Contestants in the Most Valuable Pet competition get points as well as votes. When they're mentioned on a page, or their image pops up in a calendar or a vet's brochure, their score goes up. Charles the merino ram has 'single-hoovedly' bolstered the ovine points tally by featuring in an oil painting, a billboard, and a glossy magazine. I Can See Your Votes!